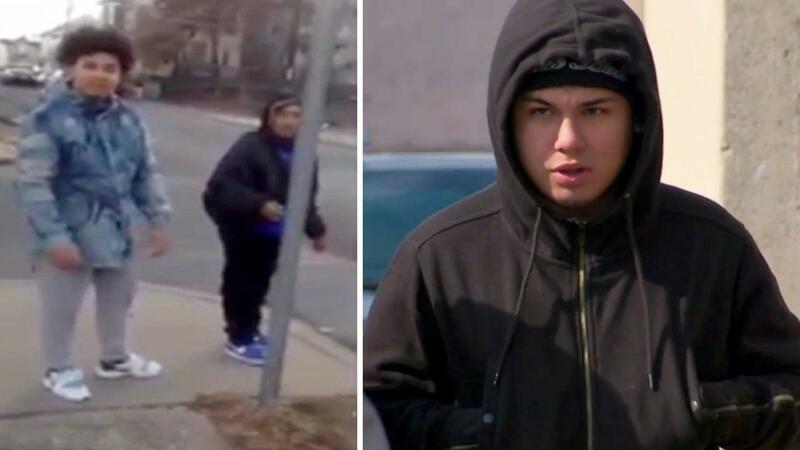 PATERSON, New Jersey (WABC) -- A man who was simply minding his own business when a teenager suddenly knocked him out with a hard punch in Paterson, New Jersey, in December is now telling his story. Cesar Nejara is a soft-spoken man. He is small in stature - he is just 5'2" and 125 pounds. Nejara also doesn't speak any English, which is perhaps why those two teenagers picked him as their target. If their goal was to intimidate him, they got what they wanted. Nejara says he now lives in fear, afraid even to leave his own home. Cell phone video from a Facebook post showing a man getting punched in Paterson, New Jersey. "I couldn't speak for a week, I couldn't even speak to my family. That's what hurt the most," said Nejara, speaking through a translator. Nejara, 37, says he doesn't know why it happened to him. Speaking through a translator, he says for 8 days after the assault, he couldn't eat solid food, and had to drink soup through a straw. "I didn't feel anything, because the impact was so hard I just fell on the floor. I don't like to pick on anybody, or pick fights. Now I live in fear," Nejara says. The knockout punch left Nejara with pain in the back of his head. He said he required stitches, because of the assault, and his mouth still hurts. The incident happened back in December, on Rosa Parks Boulevard and Van Houten Street in Paterson. It wasn't until video of the attack popped up on the internet earlier this month that investigators were able to look into the incident. Kristian Gonzalez, 18, surrendered to Paterson police for throwing that knockout punch. The teen's attorney does not deny his client is being encouraged to throw the punch, but says the teen's ADHD could be a possible factor. Gonzalez was charged as with aggravated assault, and endangering an injured person. He is being charged as a juvenile in the attacks, because he was 17 when it happened. The attack was just the latest in a disturbing trend dubbed 'The Knockout Game' - a game Nejara says he has never heard of. "Those teenagers, they have a different set of mind. I'm just human. If I was to hit anybody, it would hurt me as much as it hurt them," Nejara said, "to them just a game, but to me it's real life. They're the ones who attacked me." Nejara says he has never seen the two before. He works as a street cleaner and says he makes very little cash. He sends money to his five kids and wife in Guatemala. He had $300 cash on him that went missing after he woke up from the punch. He says he now has medical bills he is not sure if he can afford to pay, and is not sure he will even be able to replace his missing tooth. Nejara doesn't understand why anyone would want to cause random innocent people so much harm, but says he didn't want to fight back. "They looked really, really young. They looked like they were in their teens. I didn't want to lay my hands on teens so that's why I didn't attack them," he adds. Nejara says he's a religious man, but he does not forgive these teens for the pain they caused him. He says he has full faith the law will deliver justice.